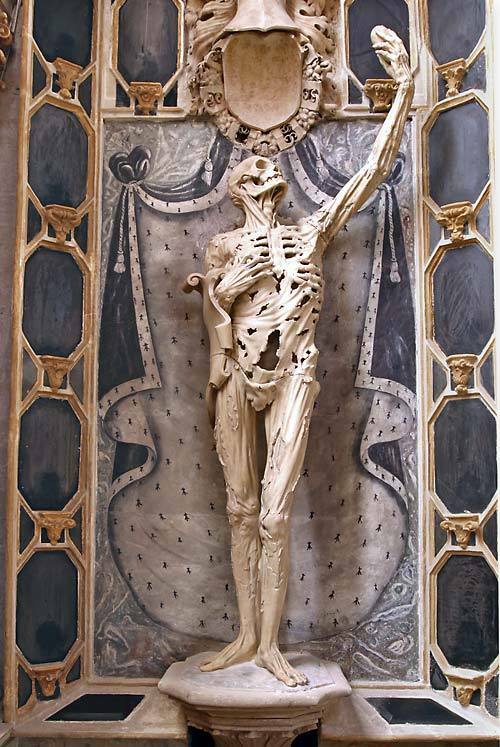 This fantastic figure, displayed in the Saint-Étienne church in the city Bar-le-Duc in France, once held the heart of its subject— René de Chalon, Prince of Orange—in its raised hand, like a reliquary. The prince died at age 25 in battle following which, depending on which story you believe, either he or his widow requested that Chalon portray him in his tomb figure as “not a standard figure but a life-size skeleton with strips of dried skin flapping over a hollow carcass, whose right hand clutches at the empty rib cage while the left hand holds high his heart in a grand gesture” (Medrano-Cabral) set against a backdrop representing his earthly riches. Alas, the sculpture no longer contains Chalon’s heart; it is rumored to have gone missing sometime around the French revolution.